48 percent of marketers say email marketing is the most effective tool for lead generation AND one of the easiest to execute. According to the a McKinsey report, email is 40 times more effective for acquiring new customers than Facebook and Twitter. Over 90 percent of consumers check their email at least once a day. Our finance clients use content marketing for an array of goals, but most focus on building credibility and garnering trust. For our client that manages equipment finance, the answer was a smart mix of formats married with email newsletter campaigns. Brafton writers created news articles and blog content around specific verticals. Part of this strategy was to get inclusion in Google News. We created several different monthly newsletters that targeted those specific verticals. These email newsletters were sent to different lists our client had segmented in their database. In-depth blog posts convey the nuance of different verticals’ challenges that impact bottom-line costs of business. Evergreen blog posts and infographics share how-to’s/ tips on money management or efficient budgeting in different sectors. News articles about business laws and tax implications analyze the effect on a business owner’s bottom line. 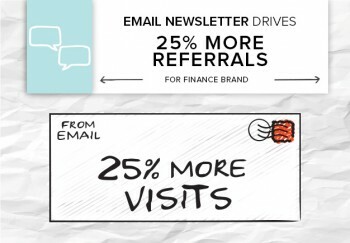 Email marketing campaigns brought in 25 percent more referral traffic. The targeted content around solutions most relevant to them helped to re-engage inactive leads. A clean database allows you to accurately splice and dice your contact lists for content nurture campaigns, which can significantly enhance what your marketing team brings to the revenue table. If you see that people with a specific job title turn into sales opportunities more often, you can prioritize these users in nurture campaigns, and content efforts at large, with the understanding that they’re more valuable for your business. We worked with this client to create segmented email targeting lists for specific verticals represented in their database. We set a rotation strategy, beginning with the contacts that had the highest likelihood email newsletters, we sent information that was relevant to each of the specific lists. Another important factor for success within this strategy? A streamlined process that includes a content calendar and a documented strategy. New research from the Content Marketing Institute shows that despite the success factor that correlates with documenting a strategy, more marketers are creating content without documentation.